So uh yeah, I feel it is my time to leave the SWD community or whatever, I'd like to say to myself I'd never come back as I feel my time is up here, however, knowing me, I generally like to come back to things I've put a lot of effort into at least partaking in, so if you see me in a couple of months, just pretend this thread doesn't exist. Aside from the message stating that I may return due to my own personality. I've been here two and some time years, and I've enjoyed the majority of my time here, which is now coming to an end, or at least a very long break. I have many reasons for leaving this community, one short term reason is I'm not active as much as I used to be, I may as well have left already. Before this section can I please state that this is my own fault and nobody else's no matter what they may think. ), very few people outside of close friends and obviously family know I have this as I don't like to share it, but honestly I don't care at this point. What I do is avoid blaming Asperger's for anything, even if it is down to just that, for example, say I kept repeating myself in a conversation and struggled to find a response without repeating myself, I would blame it on myself, even when the is clearly part of the Asperger's syndrome, which helps with fighting the actual Asperger's effect, but leads to another problem, the main reason I'm leaving, beating myself up over what other people think of me as if I didn't have Asperger's. For example, say I messed something up in a conversation resulting in that person disliking me, I would spiral into a sort of state where I keep blaming myself for whatever happened and getting stressed over what it was. Obviously all these example are real life and only somewhat apply to SWD. Basically, what I'm trying to say is, I hate social activity at times, as it then results to me hating myself. So, got the basic idea? From recent real life events, to online ones. I've became stressed, I'm beating myself up for not getting high enough a score in exams I wanted to do well in, my social interactions, which I know are terrible but can't change no matter what I try. From trying to avoid talking or talking to people I don't generally talk to. And online ones, like feeling like people who I used to be good friends with online, have started to find me annoying (which I doubt many actually do, it's just me overthinking). And I know there is probably a way to get help for this, but honestly, I'd rather figure it out for myself, I'm stressed out through everything that's happening and having to manage everything I do, not depressed or wanting to die, I don't need that type of help. But, honestly I just think figuring it out on my own, for example, taking a long break or even leaving SWD as I am now to improve on my social skills. This way, if I ever do return, I don't have to worry about what people think of me, as I'll know how to tell, and how to make things right when they're wrong. May I restate, this reason is not anybody else's fault but mine, and I know that. I also don't want people thinking this is a selfish reason. Even if it seems like one, and if it does seem like one I apologise. Okay that was a long reason, honestly it's nowhere near my original plan for this but I'm really tired but it's either I make this thread now or I'll put it off forever knowing me. While I certainly still enjoy the community, I'm not enjoying the server, I've done everything before. I've made a TARDIS, ran a hiatus town, two failed factions, one hiatus. I honestly feel like I've done everything I could have, I was even Summer Staff for a bit, which while we can all agree I was terrible at and resulted in me having to put in effort for the server, which while I may have done well, I didn't do as well as I wanted to have, evenue if I did stay, I personally don't think I put in enough effort, or even deserve to keep staff anyway. I regret taking the position as it lead me to become horrible and wanting more respect, which I may not have opening shown, but constantly hinting at "when will I get friend back" or saying "I was a former staff" in hopes of getting it back eventually after choosing to leave myself was wrong of me. But you get the point, I see nothing else to do. These reasons may be crap but I'm writing this between 11:40PM GMT and midnight, so like, I'll correct and fix up things tomorrow. Over the two and a half odd years, I'd say there were at least three slightly different personalities in me here. 1.) Simple Mew - This was near the start of MY time on DMU, after the whole flame cat situation my brother got me into, when I changed my name to TheLegendary_Mew, this was when I was happy, doing whatever I could for DMU and real life. Although I always said to myself I hated this version because of the way I acted like this. It was lnt that bad looking back. 2.) Depressed Mew - This was more so last year when I started making the "I want to die" comments. This was when I hated school and it actually came to a point where school actually made me depressed and I felt that DMU was the one place I could go to calm down. I personally thought this one was the best as it was the least annoying. 3.) A mixture - This one is more recent, I'd say just before Summer Staff, this was where is came out of the depressed phase and started enjoying school more than I did at the start, and the Summer Staff role topped it off, but made it the most annoying version. Again sorry if this thread makes me look selfish or the reasons are bad. I'm really tired, also sorry if this thread was long, I'll cut down on the uneeded crap tomorrow. Note: I may stay on the forums, as currently I'm enjoying them more than both the discord and server. P.S. If there any grammatical or spelling errors, feel free to point them out, and leave questions if you have any, I'll still be checking the forums for a while I mentioned. P.S.S.S Sorry for so many of these bu I already used the "Note", this only applies to SWD, I'll be active in stuff like Some Humans, or other stuff, it's just the main SWD community, I'll still be in map playing and things related to SWD, just to reiterate. I'm sad to hear that you're going to leave SWD , or already did ... Why don't you stay? You're a very nice guy and i wouldn't like to see you go.. Ignore the message on ur account (Ban Appeal one). It seemed like i was mad but i wasn't , i just made up my sentence wrong as you see..
As you remember i always hoped that you would rejoin SWD (When you first left). But i can't force you to rejoin so good luck with what you're going to do now. You will always be my friend and i won't forget you! No problem dude! 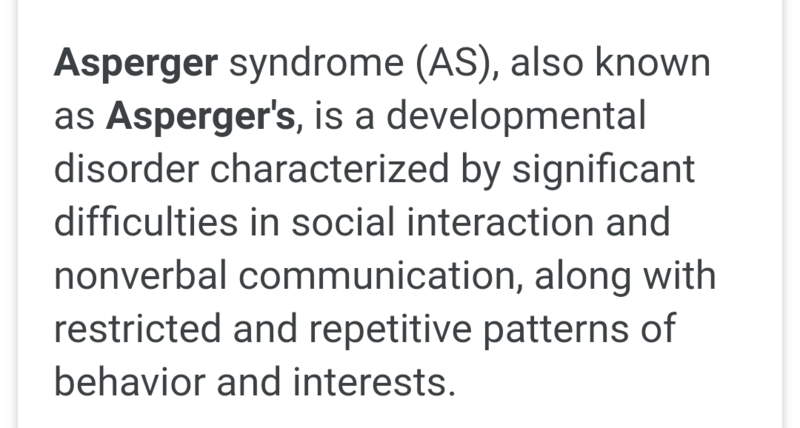 I completely understand where you’re coming from with the Asbergers due to my little brother having Autism. Enjoy your life and be successful!